A binary star whose orbital plane is orientated such that each component is totally or partly eclipsed by the other during each orbital period. The effect observed is a periodic decrease in the light from the system (see illustration). The deeper minimum corresponds to the eclipse of the brighter star. The light curve gives the period of revolution, and from the depths and shapes of the minima it is possible to estimate the inclination of the orbital plane. The duration of the eclipses compared to the time between eclipses indicates the radii of the stars in terms of the distance between them. If the system is also a double-lined spectroscopic binary the individual masses and radii of the stars can be calculated. 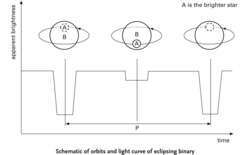 Eclipsing binaries tend to be composed of large stars with small orbits and therefore the majority are close binaries (see binary star). In these systems mass transfer affects the stars' evolution, leading to three main classes of eclipsing binaries. W Ursae Majoris stars are in contact. In W Serpentis stars one component is transferring mass rapidly to the other. In these two classes the stars are distorted into ellipsoids, an effect that shows in the light curve. Algol variables represent a later stage; mass transfer is almost complete and the stars are nearly spherical. I reported my data and timing to the Eclipsing Binary section of the American Association of Variable Star Observers. Epsilon Aurigae is a very interesting eclipsing binary system that has been intriguing astronomers for more than 150 years. Papers and discussions from the workshop describe recent work in areas such as dynamic tides and the evolution of stars in close binaries, eccentric eclipsing binary systems, and equilibrium tides in differentially rotating stars. Their fully automated code first examined the transit light curve itself--a real planet will block the star's light in a certain way that can sometimes be distinguished from imposters, such as an eclipsing binary. The opportunity has therefore been taken to observe CQ Cep in order to investigate the utility of the telescopes to study variable stars and to see whether the observations can be used together with eclipsing binary star modelling software to investigate their physical attributes. Washington, May 19 (ANI): Scientists have identified two white dwarf stars in an eclipsing binary system, allowing for the first direct radius measurement of a rare white dwarf composed of pure helium. Skelton were both registered for MScs and are working on eclipsing binary stars under the supervision of Smits. Perseus is famous for the brightest eclipsing binary, Beta ([beta]) Persei, for what some observers consider the most impressive open star cluster sight (the Double Cluster), and for Alpha ([alpha]) Persei, with its very large, bright cluster of stars. van Graan registered for an MSc on eclipsing binary stars under the supervision of Smits and Ms P.
The trio's primary star is the eclipsing binary V402 Lac. The Variable Star Section (VSS) splits its observational programmes into several different categories, which include the telescopic, binocular, eclipsing binary, nova/supernova search and CCD programmes.